But in a strange way, that brings me to my point for this post. The best intentions don’t always work out. Whenever people talk about setting goals, the usual advice is to make SMART (Specific, Measurable, Attainable, Relevant, and Time-bound) goals. Or to make realistic goals. Or to make goals that we have control over. But 2016 proved to me that what we think is realistic or what we think we have control over…isn’t necessarily the case. By most measures, my 2016 goal of editing and releasing a previously completed draft—as well as writing (or at least starting) another book—would seem reasonable. Based on my previous experience, I should have been able to edit and release that completed story by late spring or summer, especially as it didn’t need major revisions. The rest of the year could have been spent on writing the next book, just as planned. To my mind, those events were mostly under my control. I had editors and my cover artist lined up. I just needed to do my part. I’m the only one who could have screwed up the plan. However, the first bad sign for me appeared right away in January of 2016 with health issues that kept getting more and more complicated and difficult. A known issue with my toe (which was suspected to be broken) turned out to be a far more complex problem of nerves and tendons affecting both feet and both ankles that still isn’t fixed. A simple dental procedure turned out to be complicated by a rare bone infection that required emergency surgery and harsh medications with negative side effects and lots of extra surgeries. And once again, it still isn’t fixed. That’s not even counting the vision issues I started suffering from due to stress, medication, and lack of sleep. When a writer can’t read her computer monitor, that’s a problem. Those complications did more than interrupt my writing schedule. They drained my energy and left me feeling burned out, even though I also felt like I was slacking off and not getting anything done. How Do We Define “Realistic”? Goals: Are they really doable? For us? What are we willing to do to meet those goals? Priorities: Which activities will best help us with our goals? Time: What can we really accomplish during X amount of time? What trade-offs are we willing to make? Control: Do we have a Plan B for things outside our control? Energy: What if we have work-life or family-life emergencies? Would we have to push ourselves to the point of sickness to meet those goals? Life Balance: Will we still have time for family, friends, and hobbies? If not, will reaching our goals really make us happy? In hindsight, several of the points I made in that post stand out as things that I didn’t plan very well for in 2016. I pushed myself too hard in 2015, suffered for it in 2016, and then had all the complications on top of the initial issues. In thinking through everything that drained my energy last year—from multiple surgeries to destructive medications that caused bad reactions (I’m allergic to almost every treatment for both the foot/ankle and mouth issues…oh yay! )—I came up with another area we have to take into consideration when establishing our goals. We also need to keep in mind the mental aspect. A conversation yesterday with Angela Quarles, my writing bestie, reminded me of how much writing is a mental challenge. Many of us have needed to be “talked off the ledge” when it comes to our story, characters, career, critiques, rejections, reviews, contests, etc. Self-doubt is a strong antagonist in our writing life. I saw this common problem take over even more when my health issues dragged out my editing over months and months, which kept me in nitpicky editing mode far longer than healthy for my mental state. Focusing only on problems for months at a time didn’t help my enthusiasm for writing either. Sure, my goals were reasonable…at first. But then I never really changed my expectations and goals for my new situation. On the surface, I accepted the reality, but deeper down, I still felt like I was screwing up. None of that helps the mental aspect of writing. If we’re not feeling our story during drafting, our word count will suffer. If we’re not feeling our story during revisions and editing, our motivation will suffer. If we’re not enjoying the process of writing and publishing, we contemplate giving up. Are We Setting Ourselves Up to Win? So that brings us back to needing to take our mental health into account when establishing goals. And I’m talking about far more than just our energy level. With expectations like that, each push-back of my deadlines felt like a failure, and when I missed the new deadline a month or two later, that was another failure, and so on. Over the course of the year, I succeeded in cobbling together only a few productive days here and there, making every deadline a miss—and stringing together a whole year of failures. In other words, when my whole year was eaten up by non-writing monsters, I should have reassessed my goals in the big picture, not just pushed them back a month or two. Goals—no matter what they are—are a mental game, and that goes double for writing goals. So I should have set up other goals in the interim that I could win to get back to a healthier mental state. 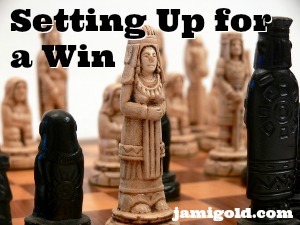 What Does It Mean to Set Up Winning Goals? That’s creating a win. They’re adding something to their list of goals that they know they can count as a win (because they already finished it). But we can do the same whether we use lists or have already finished something or not. To interrupt that cycle of short-term deadline thinking that gave me a string a “failures,” I should have added some goals to my list that would give me a few wins in there too. I could have formally added a goal to set up guest posts during NaNoWriMo, for example. Or a goal of reading through my story—without editing in mind—just to recapture the enjoyment of writing. Several of those reminders would have helped me last year, so I’ll try to keep them in mind as we step into the new year. For me, the most important one is feeling that I have permission to change my goals and priorities if things aren’t working so I can experience a sense of accomplishment from successes too. Do you set up writing goals or a yearly writing plan? Do you struggle to complete that plan or are you usually successful? Have you ever dealt with setbacks beyond your control? How did you handle those setbacks as far as your plan? Will this reminder to take our mental health into consideration with our goals help with a better balance? It’s interesting that you’re talking about setting goals and prioritizing work. I usually set goals every day, but often have to readjust them. I’ve accepted that this is part of life. This year I am learning to prioritize. Sometimes this is easy, but when you’re stressed, it becomes necessary to make some tough choices to let something go. This can be difficult but necessary sometimes. I appreciate that you give yourself permission to set realistic goals when life throws you a curve ball. We all need to do this sometimes. But we forget to be kind to ourselves. I hope that 2017 brings you improved health and forward movement with your writing. P.S. I love the design of your website. Thanks for reminding me that it’s okay to turn out one quality book, I don’t have to cram two into the same space of time. Like you I had illness but mainly flu and bronchitis, nothing deep seated like your afflictions. Get well! I did get a lot done this past year, in various areas, with luck 2017 will see me building on that success. Great post, Jami! And very appropo for me right now. Like you, chronic health problems have a way of derailing my writing plans. As a result, I make annual goals which I revisit twice a year, and weekly goals, that I make as I go. Looking at how I did the week before, I evaluate whether or not I need to raise or lower the bar for myself (usually, it’s lower…) for the coming week. I make a real effort of have realistic goals, but I feel so much better when I look back and see that I did what I said I’d do, even if it wasn’t as much as I’d secretly hoped I’d do. Real life and health issues have a way of mucking up my plans, so I don’t do detailed planning for more than a month or so at a time, and I constantly have to adjust. I hope you find solutions to your health problems and that setting realistic goals makes 2017 a big win for you. Oh Jami, I have seen you really put yourself out there and work hard, so I was quite shocked (and dismayed) to hear you were going through so much medically (and as a result, mentally)! Your blog posts are awesome. I’m so sorry you’ve been going through this. My obstacles over the past few years have been mental/emotional. The late part of 2014 up to mid-2016 has totally sucked with extended family and close family combos of arrests, court appearances, car accidents, and numerous hospitalizations. (Most of them separate entities from each other, going on at once). The cherry on top was my dad dying in May. It really is an emotional gig, and if you can’t write, no amount of sitting in front of the blinking cursor is going to cut it. We really do need to be kind to ourselves, and find the long route home. Hugs, honey. I also found 2016 was a year when I didn’t meet my writing, editing, and publishing goals because of outside factors (in my case, the need to take paying work *wink*). But I did read a lot about writing, and I found your blog a huge help. Thank you for persevering with your blog despite everything else going on in your life. I appreciate it, and I’m thankful for you. So sorry to hear that your setbacks continue. I hope they’re making headway, no matter how small. It was seven years ago when what appeared a minor health issue spun into a major one that outflanked the doctors at every turn. Those events changed the course of my life and forced me to relearn setting goals, especially mental ones. Last November/December I was to demolish NaNo, write short stories, edit, and act as a volunteer leader for a writing group during December. In mid November came the telltale signs: lung infection. Again. Prednisone to bolster the failing lungs. Prednisone side effects. Goal reassessment. I completed the NaNo novel (sort of), made it through my volunteer work, and managed one short story. Otherwise, my editing was minimal. Still, considering, I was satisfied (a little frustrated, but satisfied). Do take care. Sometimes we have to scale back, not just to make goals more attainable, but to make it possible for our bodies to heal so short-term ills don’t spiral into long-term problems. Setting way more realistic writing goals for year. I tend to overdo it, then spend a long time recovering. Need to find a happy medium. I’m so sorry you’ve had to go through this. I think this post is going to speak to a lot of people. 2015 was the year of not meeting my goals and beating myself up for it. That’s the year that I think I came closest to quitting writing/editing altogether and finding myself a nice, stable, health-benefit-providing regular job. And I think I could have done it and not looked back at that point. I was so broken and demoralized. 2016 we faced so many health issues that I don’t know how my husband and I are still standing at all. It really made me take a hard look at where my life was going and what I wanted from it–what I *really* wanted. And, of course, I’m going to blog about it as well because in the midst of it, I think I learned some things about making the most of the present rather than living for someday (which is what I was doing). Thanks again for such a fantastic post!